Donald C. Ainslie's (University of Toronto, Professor of Philosophy) scholarly work, Hume's True Scepticism (Oxford, 2015), presents a re-interpretation of David Hume's philosophy in a way that is both broad in scope and rich in detailed analysis. He seeks to explain the historical tradition of skepticism, stemming from the ancients and into modern philosophy, while positioning Hume in what Ainslie argues is the correct way to understand Hume's own admonition for caution when regarding the veracity of claims about our world and the products of our own thinking. Celebrated as the winner of the 2016 Journal of the History of Philosophy prize for best book of the year, Ainslie's volume plumbs the depth of Hume's skeptical philosophy in a way that few authors have done, and is deserving of the esteemed accolade. 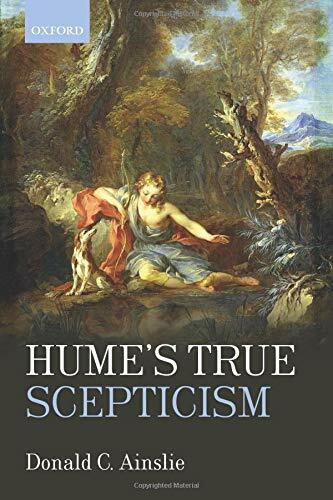 Hume's "true scepticism", it turns out, is a limitation on the aims of philosophy and what it can achieve. The bulk of Ainslie's interpretation is the product of careful analysis of several key passages from Hume's Treatise on Human Nature; with particular focus on sections 1..2.6 and 1.4.1-1.4.7—those sections entitled "Of the idea of existence and external existence (Treatise 1.2.6), "Of scepticism with regard to reason" (Treatise 1.4.1), "Of scepticism with regard to the senses" (Treatise 1.4.2), "Of the ancient philosophy" (Treatise 1.4.3), "Of the modern philosophy" (Treatise 1.4.4), "Of the immortality of the soul" (Treatise 1.4.5) "Of personal identity" (Treatise 1.4.6), "Conclusion to this book" (Treatise 1.4.7). Each primary chapter is devoted to a respective section, combining 1.4.5 and 1.4.6 in a single chapter discussing Hume's model of the mind (Chapter 6). Ainslie doesn't merely adhere exclusively to any single section in any chapter; rather, while focusing topically on a section for each respective chapter, he weaves a coherent narrative throughout the Treatise by showing how the sections are connected and inform each other. The volume can be approximately divided in two- the first half addressing skepticism in regard to our belief formation and endorsement, both about the products of our reasoning and our beliefs about objects in the world; the second half situates Ainslie's interpretation of Hume's skepticism in relation to philosophical systems, both ancient and modern, as well as other interpretive strands in Hume scholarship. The former focuses on objects and our beliefs and attitudes towards them, and Hume's considered opinion about them; the latter's topic distinguishes how Hume's skepticism will provide a model of the mind that differentiates him from other philosophers both ancient and modern. With the two halves of the book, Ainslie is able to provide a coherent interpretation of Hume's theories about the nature of our minds, their processes and the objects of cognition. It would appear that much of the primary motive behind writing this volume comes from and admission of Hume in the section "Conclusions to this Book", wherein Hume admits a certain despondency that is the product of critical analysis of the role of reason and our belief formation, followed by a drive to distraction in the form of physical and social interaction, and then a return to a philosophy under the aegis of a "true sceptic". Ainslie opens chapter 1 with this reference in mind and explores Hume's analysis of how much and what role reason plays in cognition, the de facto trust we place in reason, the paradoxical nature of reason's products, and the traditional philosophical skepticism that is the result of a self-referential paradox of the products reason. For Hume, this is a true concern and could possibly lead us to succumb to a total skepticism that would have us abandon all our beliefs. Ainslie, and Hume, find a way out of this quandary by suggesting that it is "not in our nature" to abandon all our beliefs—a practical exigency of everyday living solicits that we endorse something. However, Ainslie's interpretation of Hume's resolution to this quandary rests upon a recognition of the "custom" and "habit" of endorsing the causal connections we make, and these beliefs are a product of a remarkably well-hidden process of imaginative association- what Ainslie describes as a "vulgar belief". Such a belief amounts to a continued use of our reason and its products, but with an acknowledgment that there is no fundamental justification that will provide certainty regarding its processes or products. According to Ainslie's interpretation of Hume, this is the "true scepticism" that is the result of philosophical thinking. It is precisely this interpretive strategy that Ainslie deploys in Chapters 2, 3 and 4; the topics of which all focus on beliefs concerning objects of the external world, our perceptions of them and philosophical analysis, "scepticism", regarding them. Chapter 2 is devoted to an analysis of our perception regarding objects in the external world, but as evaluated by our own ideation, perceptions, of them. The textual focus centers around Treatise 1.4.2, "Of scepticism with regard to the senses". Here Ainslie puzzles through Hume's claims that "vulgar" beliefs about objects are that these objects continue to exist when unperceived and exist distinctly from our perceptions of them, and that we have direct contact with such objects. In short, objects exist and continue to exist whether we perceive them or not, and, when we do, we perceive them as they are. Moreover, these objects exist in a persisting and public space to which able persons have access. The philosophical conundrum appears when we realize that it is only through our perceptions that we could affirm or deny such beliefs, and hence no fundamental justification concerning our beliefs about objects is readily available. This chapter places Hume in context of his empirical forebears, chiefly John Locke, and focuses on the nature of our perceptions, whether they should be understood as images, the transparency of the mind and how our experiential immersion in a world of objects lends itself to Ainslie's endorsement of the "vulgar" understanding of our perceptions and their relation concerning objects in the world. Chapter 3 continues on the trajectory of the preceding chapter, but focuses on the coherence, constancy and continuing existence of objects. Here Ainslie couples Treatise 1.4.2 with 1.2.6, "Of the idea of existence, and of external existence". It is here that the full development of Ainslie's interpretation of "vulgar objects" is on display, and the mechanisms and processes whereby we arrive at them. The primary process by which we arrive at "vulgar objects" is through imaginative association. When we experience objects that continue with coherent perceptions, the imagination further extends this coherence beyond the immediate perceptions. Thus we believe that stable objects exist and continue to exist, even when not perceived. This process of "idea substitution" results in the public space and a continuing world in which we find ourselves immersed, even if it is the mere product of imagination. Ainslie doesn't interpret Hume as deriding the products of the imagination in his analysis here; but, rather, provides exposition of the text to demonstrate Hume's belief and commitment to a philosophical understanding of our associations of ideas, even if it leads to a censure of knowledge claims. Ainslie's interpretation provides support for Hume's famous distinction between probability and certainty, and why Hume concedes that sense experience, with all its fallibility, is merely probabilistic. Even though the 'vulgar" do not typically admit the probabilistic nature of the claims of sensory knowledge, Ainslie argues that their knowledge claims concerning external objects are not an unmitigated error, rather, it is merely a philosophical error in their belief in direct access to said objects. Nevertheless, the "vulgar" and their beliefs concerning external objects is correct, not on philosophical grounds, but on the pragmatic grounds of human activity, and this will permit Hume to avoid total skepticism and embrace its true form. The true form of skepticism and how it applies to objects of the external world and our process finds its proper treatment in Chapter 4, and Ainslie demonstrates the parallels between the skepticism regarding our reasoning, found in chapter 1, and the skepticism we should hold regarding our sense experience. It is here that Ainslie tackles Pyrrhonism head on, claiming Hume denounces it as an extravagant position, one that gets caught up in its own logic (as seen in chapter 1) and is forced to do so again with regard to the senses as well. Philosophical reflection on our sense experience and the knowledge claimed thereby leads to a skepticism about the nature and existence of objects in the world, but total skepticism is untenable, as it is not in our nature to doubt everything all the time. Such reflective skepticism is combatted by an instinctive tendency to believe in objects and reasoning, part of our nature, despite "philosophy's incapacity to offer a reflective endorsement of them." Thus true skepticism is indicative of the limits of philosophical justification for our beliefs and actions, rather than about the objects and beliefs of which we find ourselves in possession. The second half of the volume is dedicated situating Hume's philosophy in a broader philosophical context. Hume himself provides sections on Ancient and Modern philosophy and the subsequent skepticism(s) that are the product of various authors' thoughts. Ainslie examines these sections in order to distinguish Hume, and Ainslie's interpretation of Hume's skepticism, from other forms of skepticism found in the history of philosophy, and to further clarify what Ainslie considers the proper reading of Hume in the larger philosophical discourse. Chapter 5 primarily focuses on Hume's analysis of ancient systems of philosophy, which consider the mind to be a substance or soul. Ainslie demonstrates how Hume's analysis of "ancient systems" (which will include Spinoza) arrive at a substance ontology, and how these deep structures enabled such philosophers to posit a metaphysics to which they claim we have access. In addition, Ainslie deploys Hume's analysis to draw a sharper epistemic distinction concerning the privilege and access we have in our inner realm of perceptions, how access to those deep structures is superior to our access to objects of the external world, in order to draw even sharper distinctions between Hume and any philosopher preceding regarding the nature of our mind. Ainslie's target here is to deploy his interpretation of Hume's commentary to defeat substance ontology, primarily as it relates not so much to the objects of the external world (but that too), but, rather, to establish substance ontology's conception(s) the mind/soul as another species of "false philosophy", one that finds itself alongside "false scepticism" in the annals of philosophical history. Chapter 6 continues the assault on mistaken notions of the mind and personal identity, but in the modern context. Here Ainslie deploys Hume's exacting analysis of Locke's "forensic" notion of personal identity, and the determinate errors that are the product of Locke's philosophy. It is here that Ainslie is able to illustrate how radically different Hume's "bundle theory" of the human mind is from his historical contemporaries. Ainslie masterfully treats the subtle differences Hume makes between himself and Locke, and the consequences thereof, pointing to the too common conflation interpreters make between them and Hume's own exacting position. Much of his argument here depends upon a careful analysis of consciousness in both philosophers' thinking, and inevitably leads to Ainslie's conclusion that Hume completely rejects Locke's account of personal identity, and that the bundle theory is a radical departure from all other empirical descriptions of the mind. One important consequence of this analysis permits Ainslie to return to themes from chapter 2, and he is able to provide a more complete answer to the nature of perceptions according to Hume—that perceptions are not mental objects, rather they are activities, perceivings, occurent in the moment, but nothing more. It is in Chapter 7 that Ainslie tackles the monumental task of locating his own interpretation of Hume in light of contemporary scholarship. The device for doing so returns to the opening thematic that has presented a quandary to readers of Hume, that of the personal narrative Hume provides in the "Conclusion of this book" section of the Treatise. In this section Hume describes his philosophical journey through the arguments concerning "scepticism with regard to reason" and "scepticism with regard to the senses" and how it has led Hume to an impasse with regard to reconciling his philosophical examinations, its products and life. Ainslie employs the description of philosophical inquiry, despondency, distraction and the return to honest philosophical curiosity to demonstrate the variety of interpretive strategies regarding Hume's skepticism. Here Ainslie shows how fair his treatment is of contemporary scholarship, pointing out his sympathies for aspects of various interpretations while pointing out their shortcomings, which allows Ainslie to incorporate the excellent work of other contemporaries while setting his own strategy apart from those others. This chapter is the high-water mark of Hume's own writing, and Ainslie's interpretation as well. It culminates by pointing out that, according to Hume, philosophical inquiry is optional, while lived experience is not, and that the limitation of philosophy is conceding the inability for us to find a fundamental ground and justification for our beliefs about ourselves and the world around us. By limiting what philosophy can accomplish and returning to a "vulgar" understanding of the world, we stave off intellectual despondency and return to inquiry with honest expectations of what we can know and the means by which we arrive at such conclusions. "True scepticism" is not to reject philosophy or philosophical inquiry; rather, it is to temper our claims and admit our epistemic humility. While each chapter in this volume serves as a stand-alone examination of various topics in Hume's philosophy, each chapter concentrating on a few select passages from various sections of Hume's Treatise, Ainslie deftly interweaves the themes through each chapter to present deep insight into Hume's overall philosophical position. It is an intensely scholarly work, and requires a facility in the history of philosophy and Hume's own thinking, but for those who desire to gain insight into Hume's philosophy it is a must read.